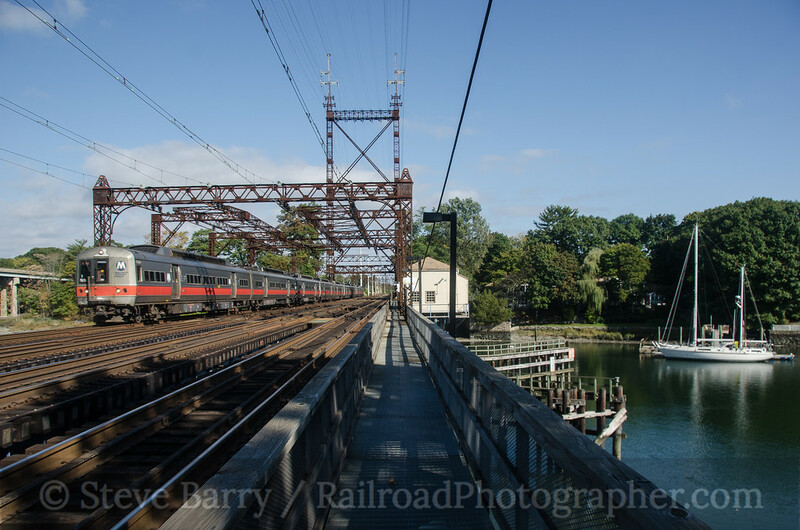 During the fall I started exploring some of the Metro North commuter lines I had been ignoring. There are some interesting locations on the East-of-Hudson routes -- the Hudson, Harlem and New Haven Lines. 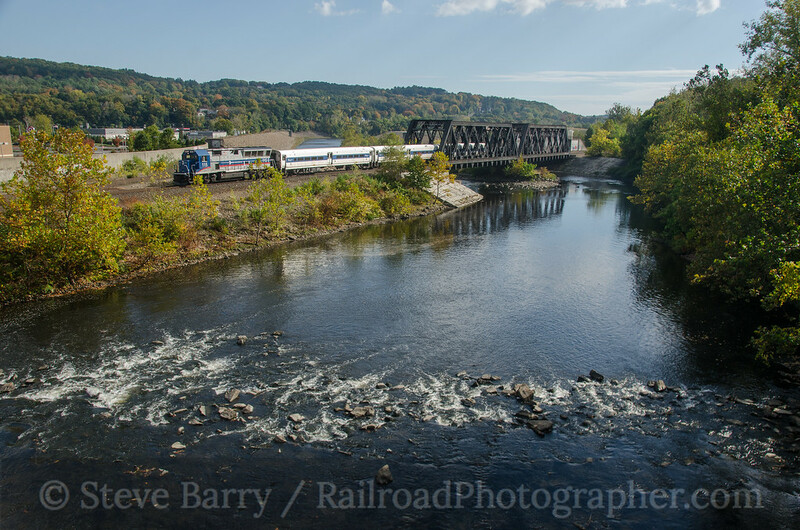 The exploration started on October 12 on the way to a night photo session in Willimantic, Conn. A diesel-powered train on the Waterbury Branch (which comes off the New Haven Line at Bridgeport) made for a nice view, even if the autumn colors were changing late. 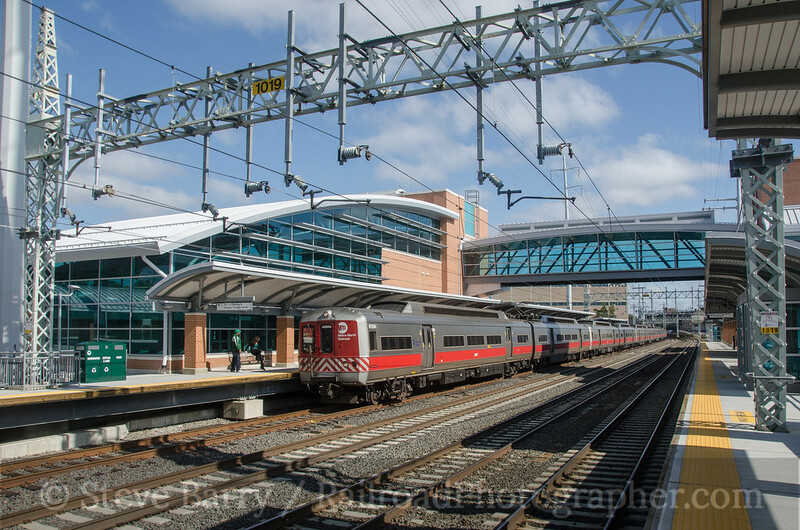 The following day I followed the New Haven Line, pausing to check out the new station at West Haven, which just opened this year. A set of General Electric M2 "Cosmopolitan" cars -- the oldest operating cars on the New Haven Line -- made a nice scene going through the new station. Moving west that day I made a pleasant discovery -- the moveable bridge at Westport, Conn., actually has a public walkway along the tracks. The bridge crosses the Saugatuck River near where the river empties into Long Island Sound. 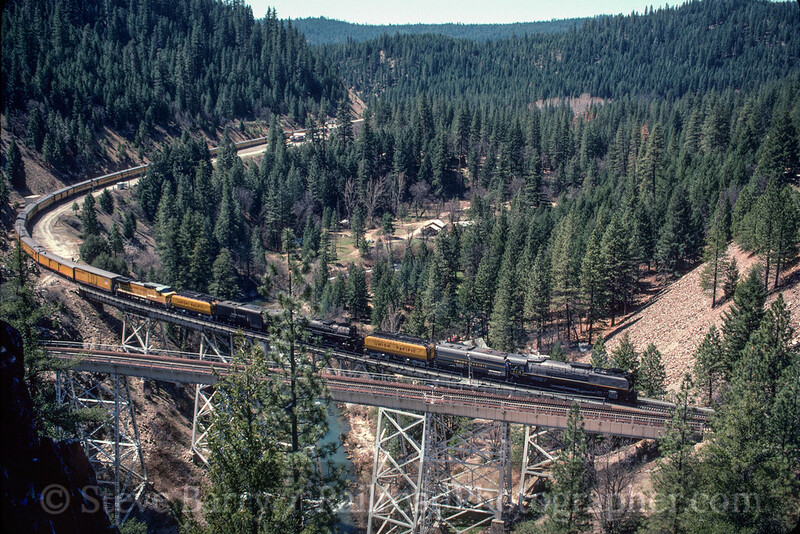 A set of M6 cars, built by Morrison-Knudson, were seen passing the bridge operator's cabin. By October 19 the colors were beginning to change in the Hudson Valley. 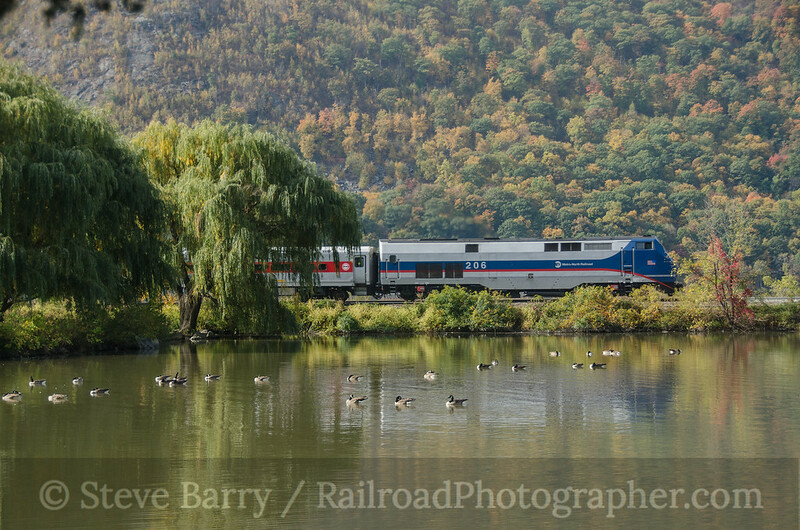 A northbound Metro North train passed a small pond just north of Cold Spring, N.Y., behind a General Electric P32AC-DM diesel. Storm King Mountain across the Hudson provided the backdrop; the geese seemed unimpressed. There is probably no better photo location in the Hudson Valley than off the Bear Mountain Bridge north of Peekskill. It provides good views of the Metro North track (also used by Amtrak and the rare CSX freight) on the Hudson's east shore, while the fairly busy CSX River Line is on the appropriately named former West Shore line. A northbound train circled Anthony's Nose (the mountain at the east end of the bridge) on the mid-fall day. A week later I was on the Harlem Line. While the Hudson Line has diesels on its north end and a mix of diesels and electric multiple unit cars on the south end, and the New Haven Line has electric cars with some diesel trains, the Harlem Line is entirely the domain of multiple unit cars. 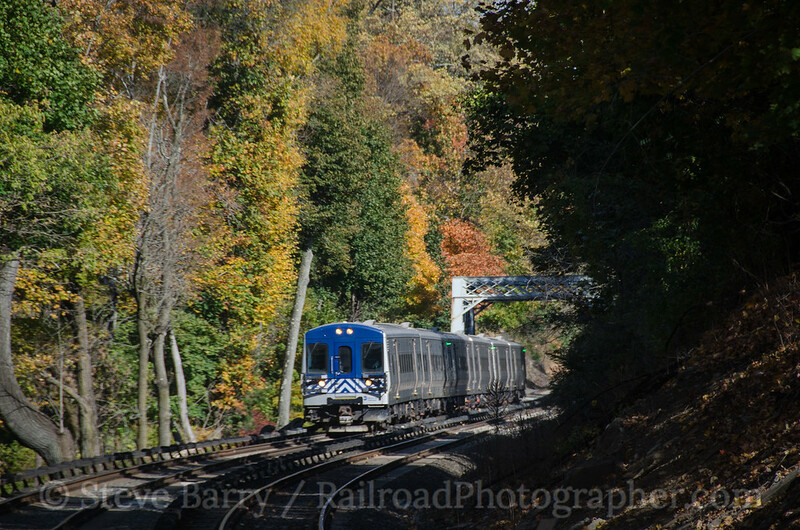 A set of M7A cars, the newest on the Harlem Line, crossed the through truss bridge amid late fall colors just north of the Scarsdale station on October 26. 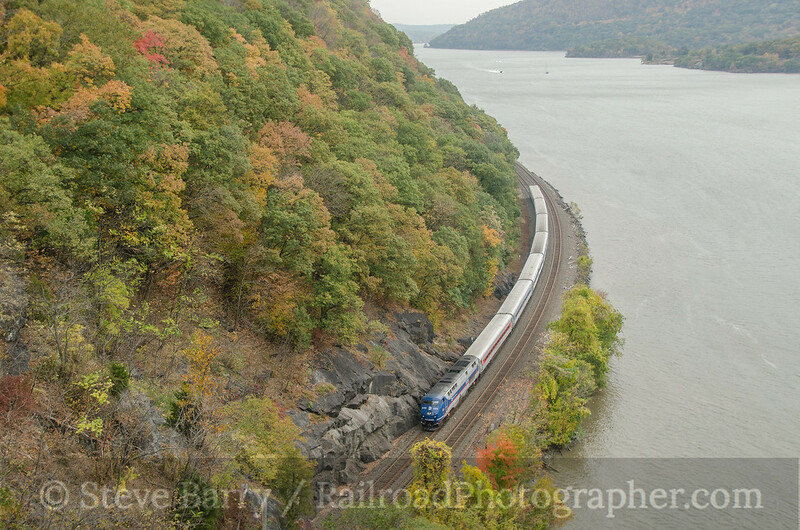 A month later, on November 23, the fall colors were still hanging in there in spots on the Hudson Line. 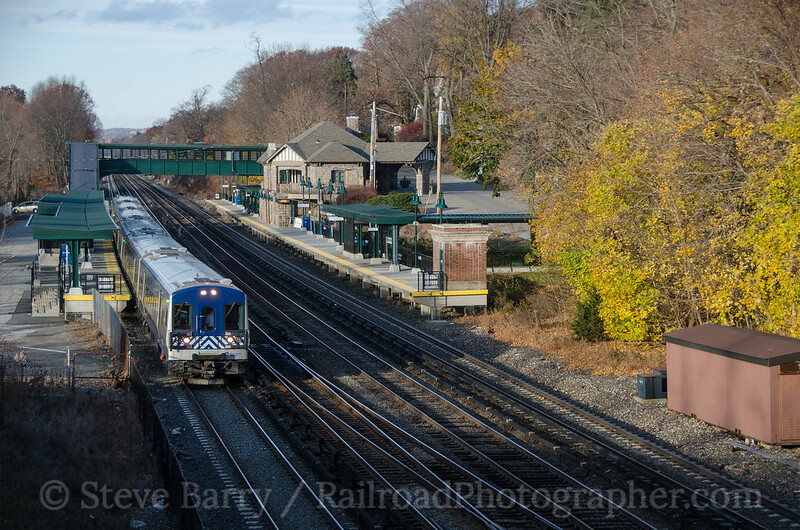 A set of M7A cars paused at the Phillipse Manor station just north of Tarrytown. The splash of yellow is a teaser that says I have to get back next year. The late fall air had pushed the summer haze out of the Hudson Valley, opening visibility down to New York City. 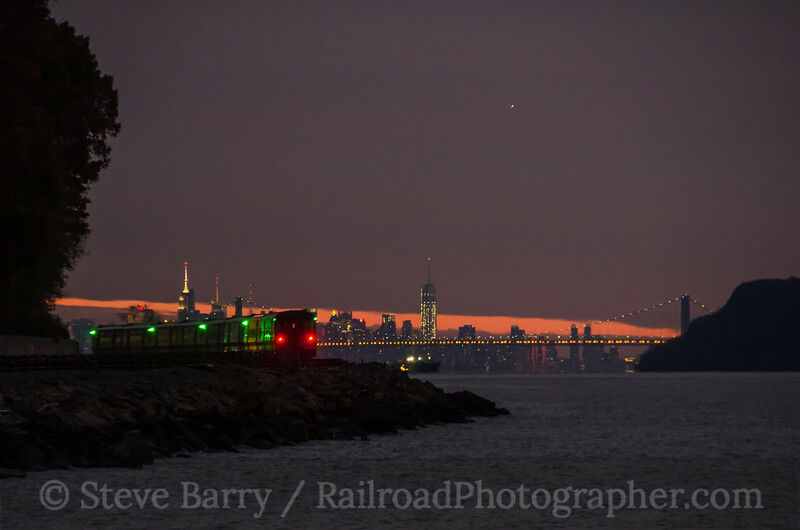 At Dobbs Ferry a southbound set of M7A cars headed towards the bright lights of Gotham with the George Washington Bridge providing a gateway arch over the Hudson River. 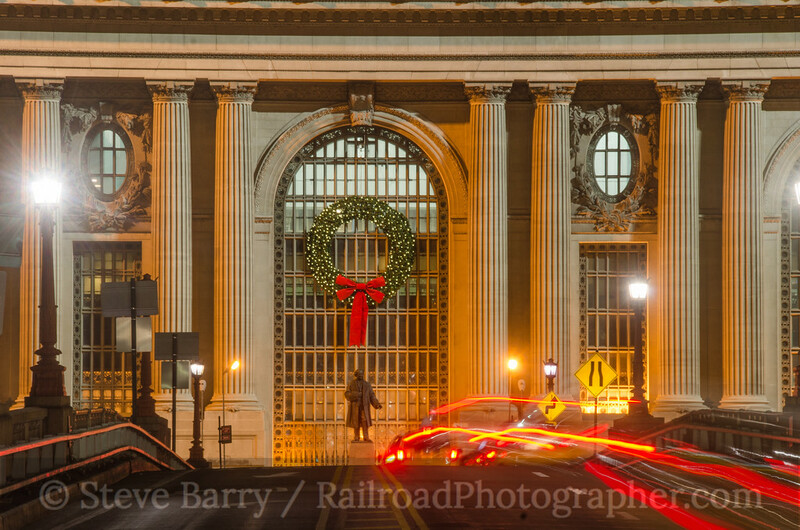 We're back on the Harlem Line as the Christmas season begins to gear up on December 7. 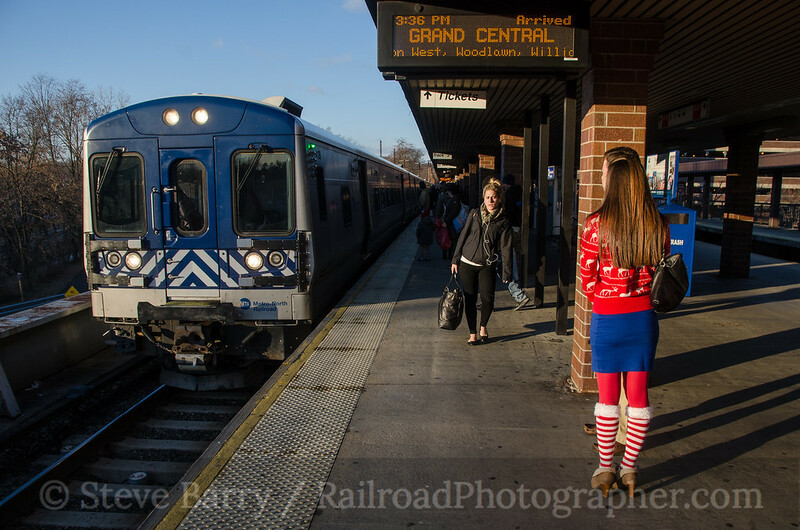 At White Plains, N.Y., people are dressed festively as a southbound train rolls into the station. Even on weekends the railroad remains busy. 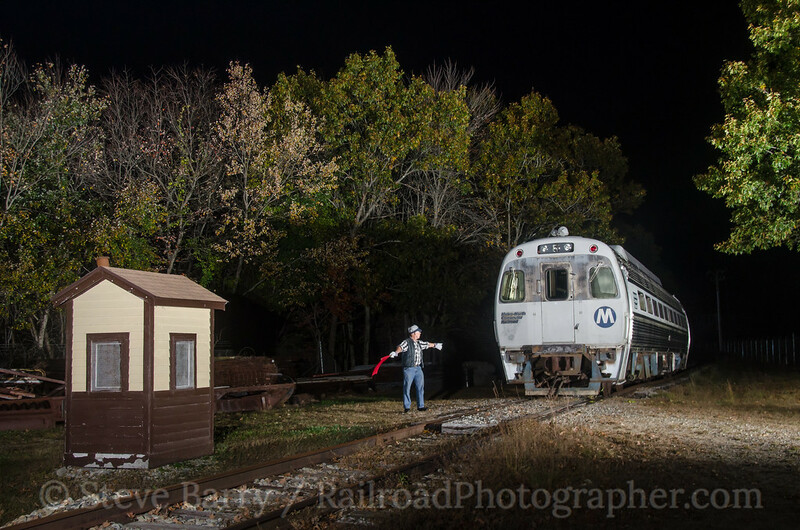 We'll finish off our journey through the end of 2013 on Metro North with a ghostly apparition. Metro North had purchased several self-propelled cars from the Budd Company in the 1980s. Officially known as Self Propelled Vehicles (SPV's), they were quickly dubbed Seldom Powered Vehicles. Unreliable working on their own, most became coaches hauled by diesels. An SPV ghost seems to be coming out of the darkness. Actually, this SPV is preserved at the Connecticut Eastern Railroad Museum in Willimantic. True to its historic reputation, this car is not powered. And with that we complete our journey to 2014. Happy New Year!!!! You can see a gallery of all of my favorite photos from 2013 by clicking here. A gallery of all the photos taken this day can be found here. 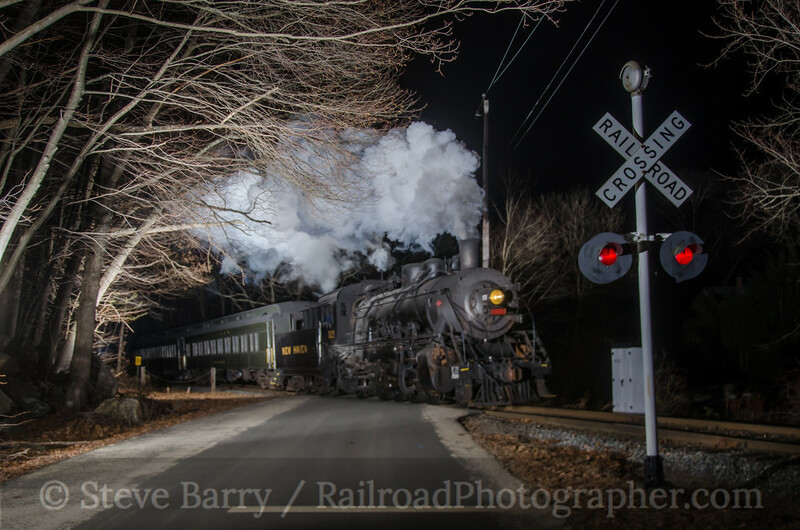 It's quite hard to find steam locomotive movements after dark for night photography with one exception -- around Christmastime several steam railroads run Polar Express, North Pole Express and/or Santa Claus trains that feature Christmas lights. 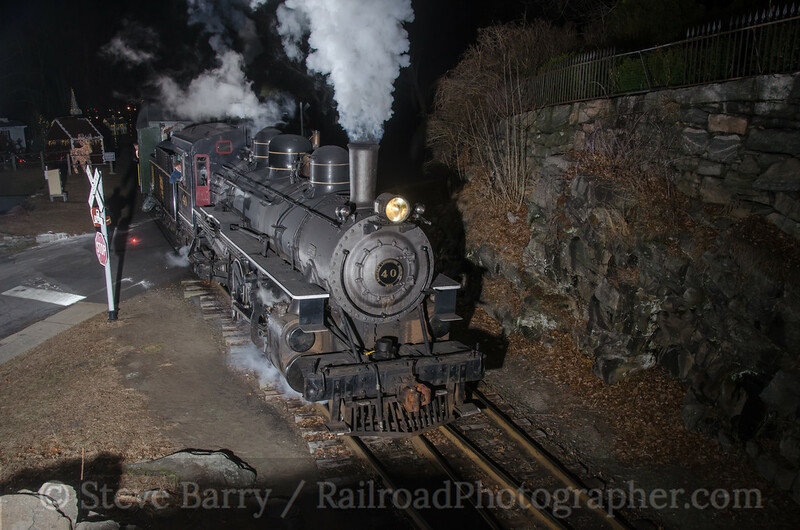 The best show from a photography standpoint is perhaps the Valley Railroad in Essex, Conn. Its trains are so popular that two trainsets are needed to run four trips an evening, and two trainsets means two different steam locomotives. 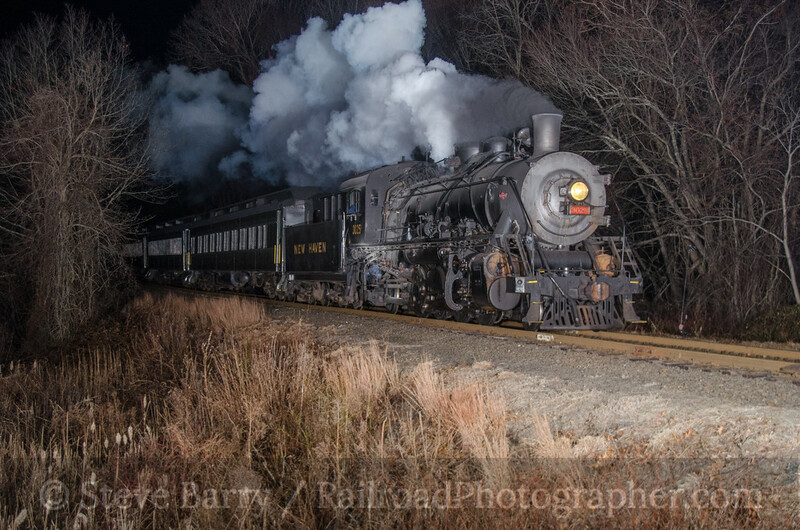 The trips run every night from Thanksgiving weekend until after Christmas, with this year's final trips occurring on December 29. I hadn't been able to get up to Essex this year before Christmas, but took advantage o Santa's busy schedule to get up there on December 27. The first train departed at 5:00, and I was able to get it at Old Deep River Road in the community of Chesterbrook on the fringes of Essex (above). The power on the first train was "New Haven 3025," a Chinese-built steam locomotive configured to look like one of the 2-8-2s that worked for the New York, New Haven & Hartford. 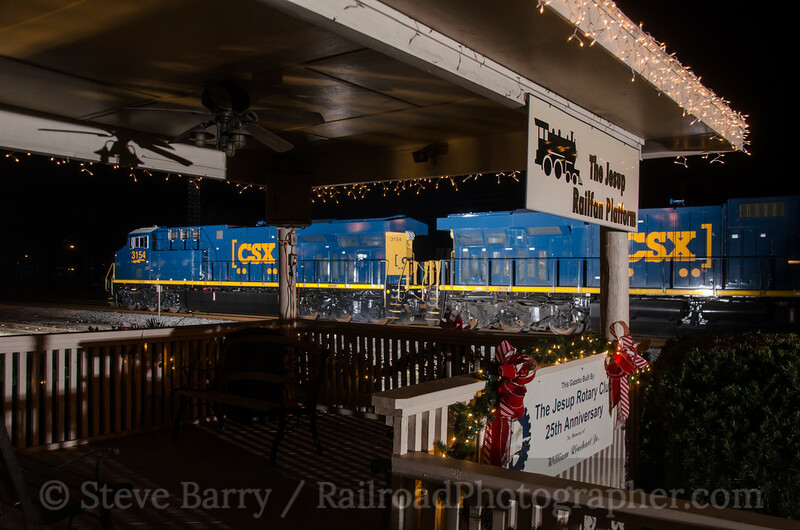 The trains head north from Essex and head to Deep River, which is decked out as the "North Pole." Santa boards here and the train continues north to Chester with hundreds of screaming delighted kids. Meanwhile, the second train departed Essex at 5:35. 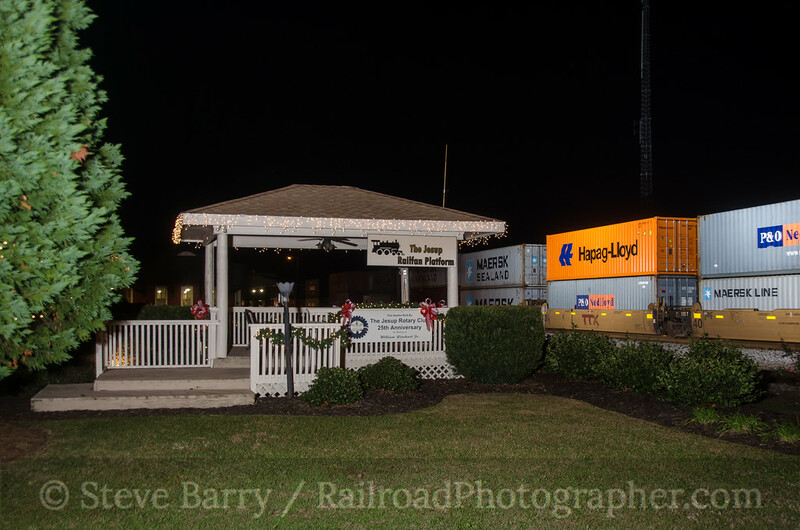 It took the siding at Deep River to load its Santa. Eventually, No. 3025 pushed its train back from Chester into the North Pole. Once No. 3025 has pushed back into the clear, the second train -- led by 2-8-2 No. 40 -- pulled out of the North Pole for the run to Chester. 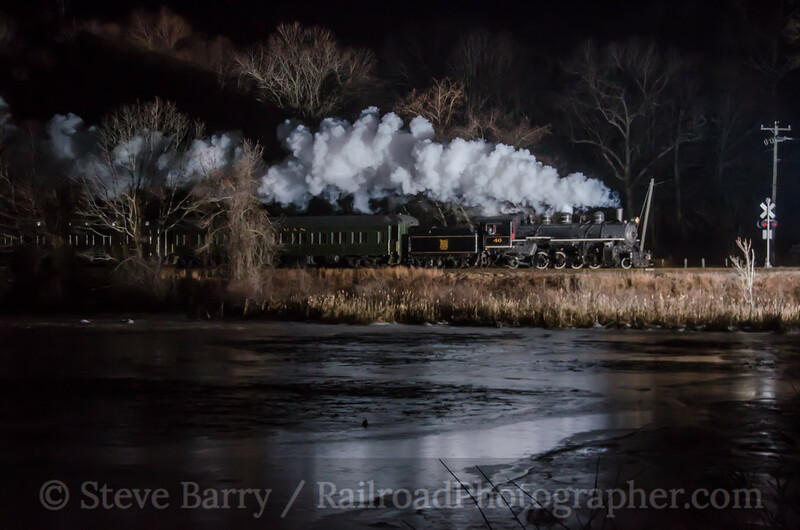 The entire process would be repeated at 7:00, so I headed to Essex Street outside Deep River (and just south of the North Pole) where I was joined by Tom Nanos, a local shooter who has done some great work over the years with the Santa trains. I set up my strobes in a way that the same set-up could be used for both the 7:00 and 7:35 trains but with different camera angles. I went up close for the 7:00 train with No. 3025 in the lead. Finally, the 7:35 train (running a bit late) headed north. For this shot I pulled back for an across-the-water shot. Often this shot has a nice reflection, but the cold weather meant the water was ice covered. After getting this shot I packed up my gear and headed back to New Jersey. There are things I would do differently, so no doubt I'll be back again next year. Cool Chromes is a semi-regular feature that looks at recent slides that have gone through the scanner. All the latest scans can be found here. From the time it was restored in 1981, Union Pacific No. 3985 has been (off and on) the largest steam locomotive operating in North America, if not the world. No. 3985 was built by the American Locomotive Company in 1943 and was one of 105 nearly identical locomotives ordered by Union Pacific with the 4-6-6-4 wheel arrangement -- UP dubbed this class of locomotives as Challengers. Today, only two Challengers survive, with sister 3977 on display in North Platte, Neb. No. 3985 was taken out of regular service in 1957 and officially removed from the roster in 1962. Restoration for its second life as an excursion engine began in 1979. My first encounter with No. 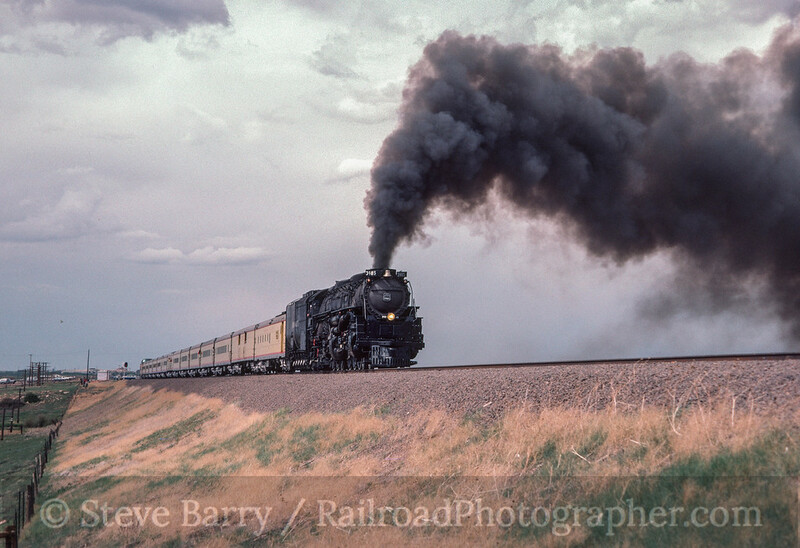 3985 was on May 26, 1985, on an excursion out of Denver, Colo., heading to Laramie, Wyo. UP operated many fan trips over Sherman Hill (located between Laramie and Cheyenne, Wyo.) with diesels pulling the train from Denver into Wyoming where the steam locomotive would take over. 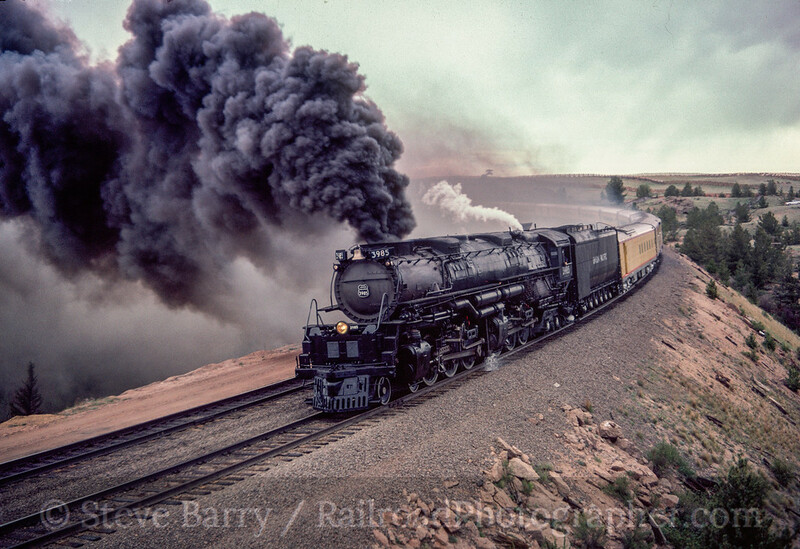 The Sherman Hill trips were famous for their numerous quality photo runbys, and Steve Lee and the rest of the UP Steam Team didn't disappoint -- plenty of smoke was the norm. The two shots above and the one below were taken on this particular trip. I would do another Sherman Hill trip in 1988, but for this post let's skip ahead. Our next shot shows Union Pacific sending both of its active steam locomotives -- No. 3985 along with 4-8-4 No. 844 -- to Railfair at the California State Railroad Museum in Sacramento in 1991. The two are seen at a classic California location, Keddie Wye, on their way to the Fair. No. 3985 would return to California in 1992 for the convention of the National Railway Historical Society in San Jose. Following the San Jose convention in 1992, No. 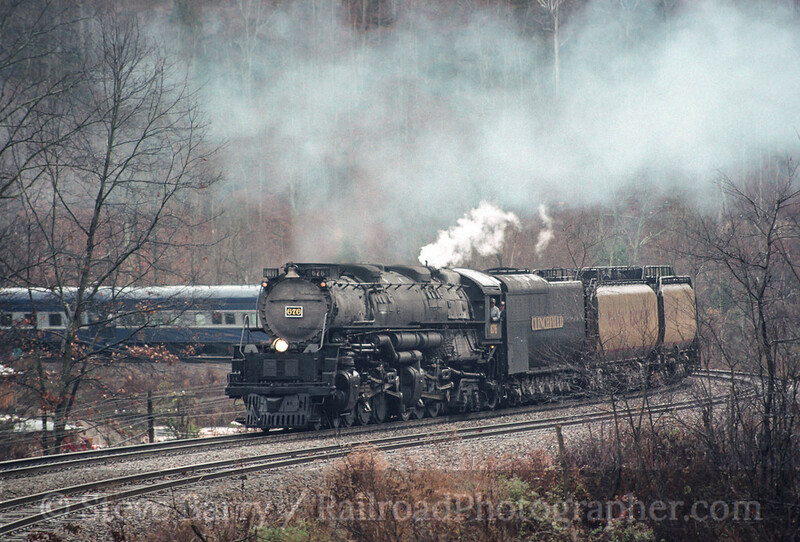 3985 made its most ambitious trip off UP rails, heading to the former Clinchfield Railroad in the Appalachian Mountains. The Clinchfield operates a Santa Train that distributes toys to the towns along the line, and 1992 was the 50th running of the famous train. To celebrate the anniversary, CSX (successor to the Clinchfield) arranged for 3985 to come east. The Clinchfield at one time operated Challengers very similar to UP's, so 3985 was given a makeover to "Clinchfield 676" (one number higher than the last actual Clinchfield 4-6-6-4). Our final shot of the day shows the 50th Anniversary Santa Train at Boody, Va., on November 21, 1992. 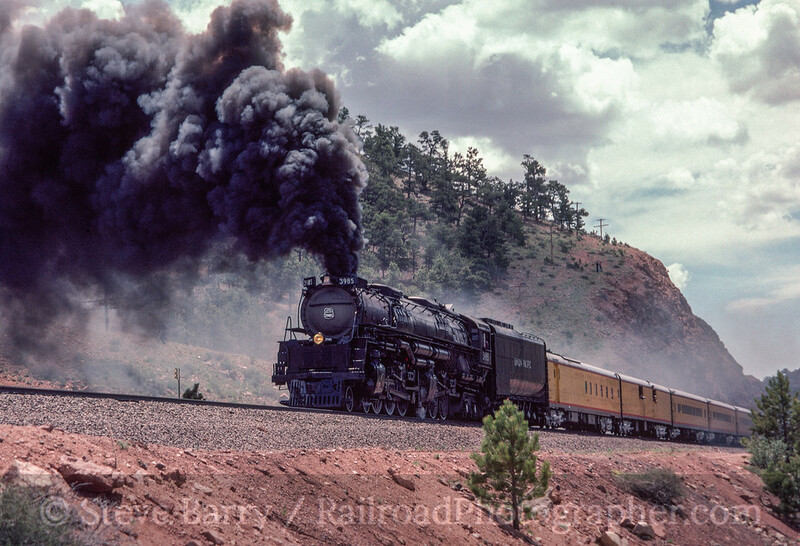 And you can find a complete set of Union Pacific Steam Program photos here. All photos taken on this day can be found in Photo Lines here. 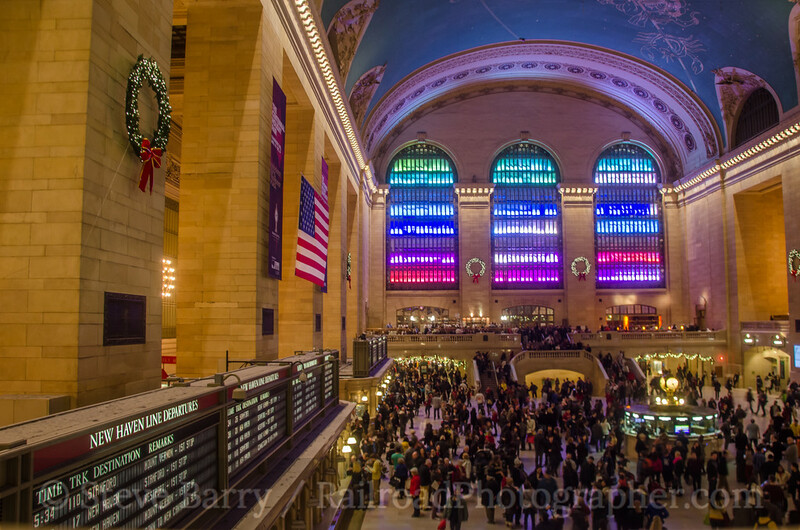 A couple of weeks ago we ventured into New York City to take a look at the Centennial Holiday Light Show at Grand Central Terminal in New York. 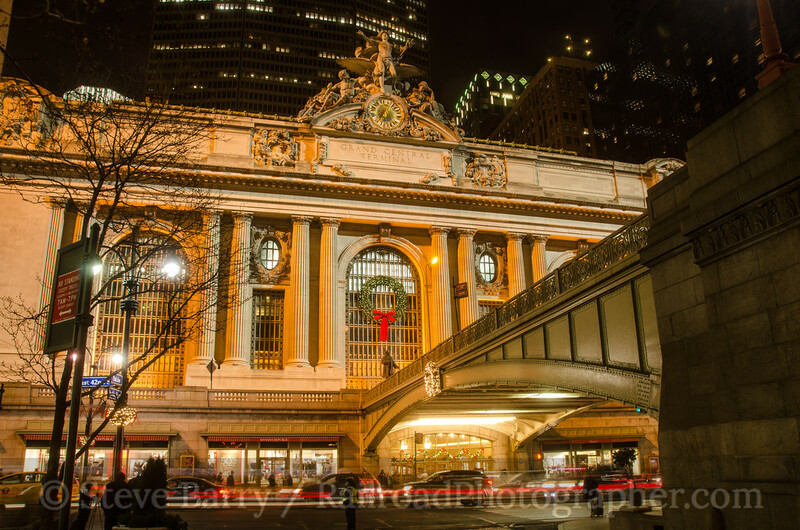 With an unusually warm evening occurring on December 21, I headed back into Gotham for a walk around the exterior of Grand Central and a visit to the former New York Central Building (now the Helmsley Building) a couple of blocks north of GCT. 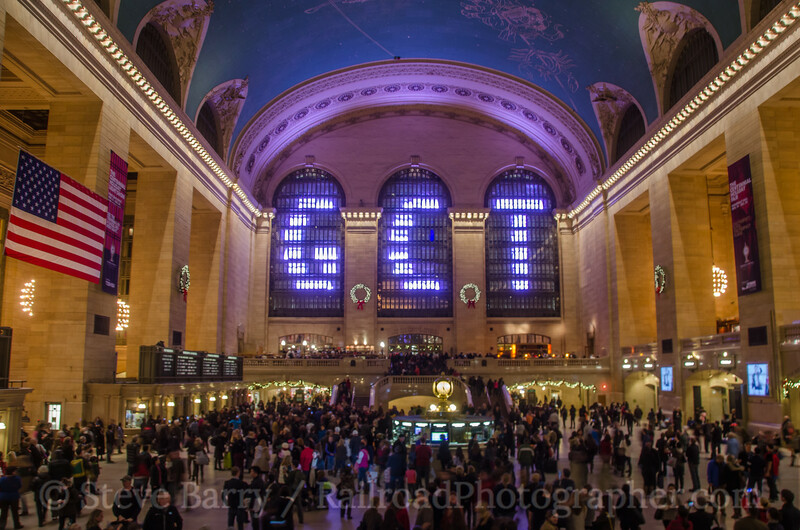 First up was the beginning of the Holiday Light Show -- I had managed to get a slightly off composition of the beginning of the show last time when "GCT" was displayed in the windows, so that was remedied this time. 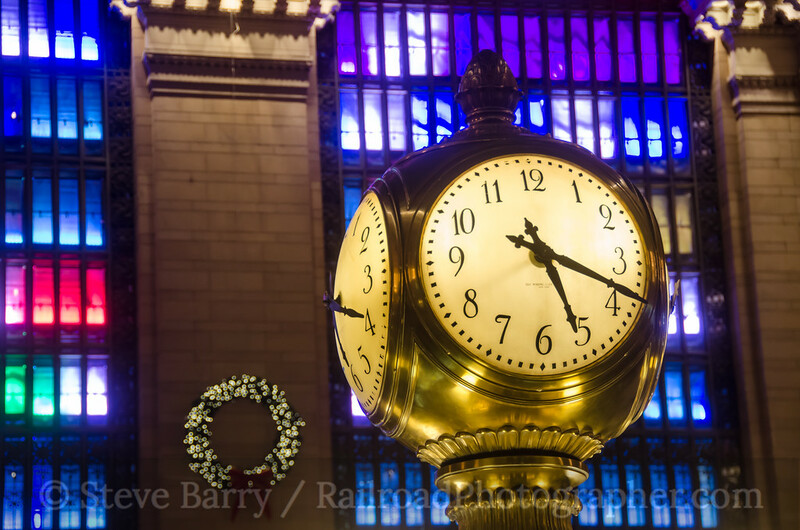 One the iconic images available in new York is the clock in the middle of the Terminal's concourse, and it drew some attention for a few shots before heading outdoors. All four faces of the clock are made from high-grade opal, and the clock is valued at somewhere between $10 and $20 million. If you need to meet someone in New York, meeting under the clock is probably the most famous place to do such a thing -- four generations have met here through the decades. As I said, the evening was quite pleasant so I headed outside and walked north several blocks. The New York Central Railroad had offices next to Grand Central Terminal, and that building survives today, now known as the Helmsley Building. 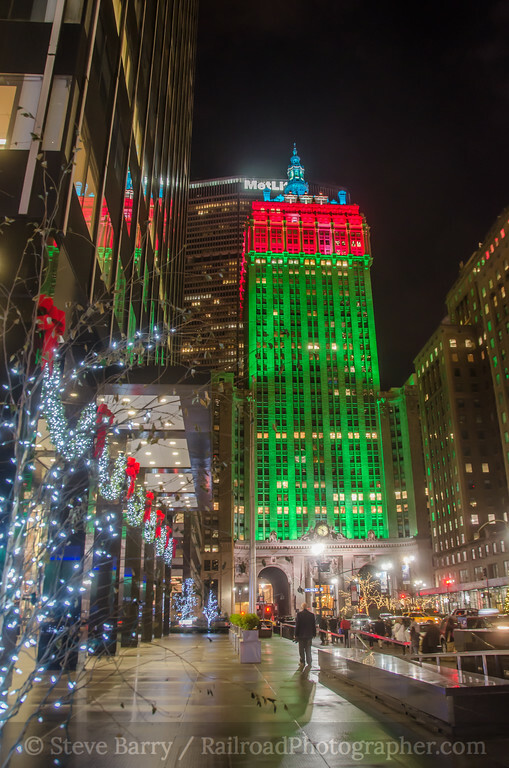 The impressive structure is lit throughout the year (as is Grand Central), but for the holidays it receives a red, green and blue treatment. Grand Central was opened in 1913; the New York Central Building was built in 1929 as part of "Terminal City" and was designed by Warren & Wetmore (who also designed GCT). At 35 stories tall, the NYC Building dominated the skyline around the terminal until the construction of the Pan Am Building (now the MetLife Building, opened in 1963). 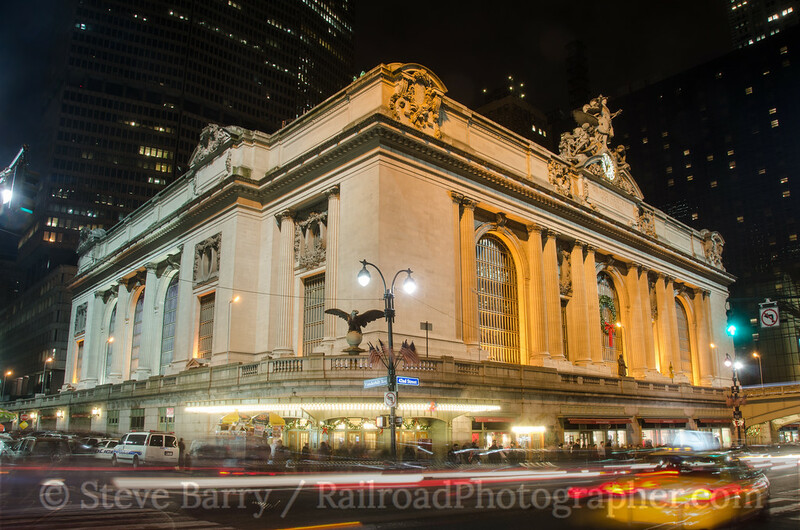 From there it was back to Grand Central for some exterior shots. 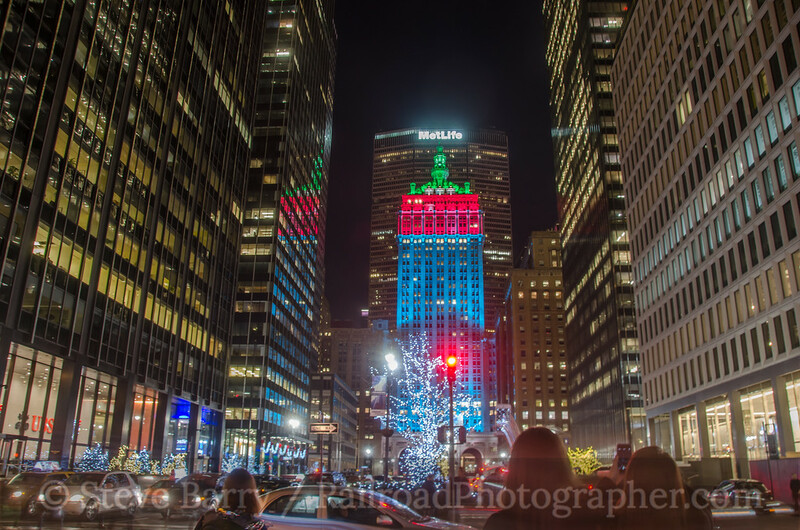 At this point I'll wish you a Merry Christmas and leave you with a few scenes from outside Grand Central. All the photos from this day can be found here. In mid-December my mother needed a car delivered to her in Florida, so my brother Bruce and I drove to the Sunshine State with some photography along the way. We'll be bouncing around with different parts of this trip for a few posts, starting with what was actually the fourth day of the trip. 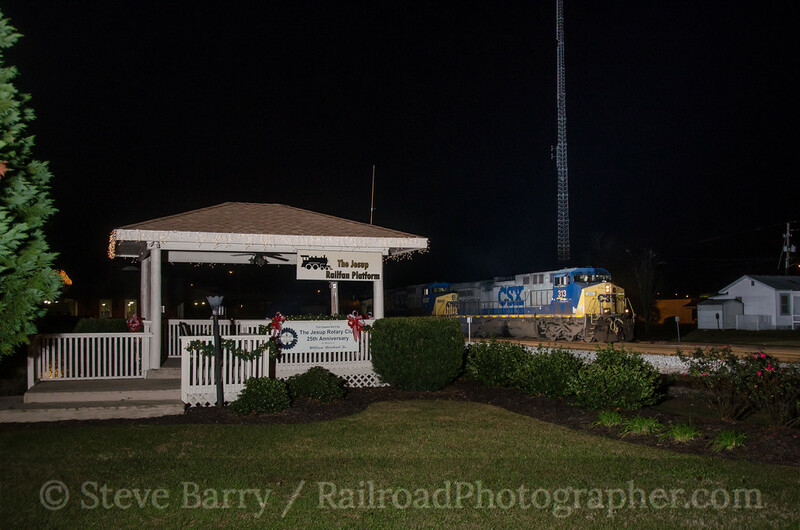 The morning of December 15, 2013, was spent in Augusta, Ga., (more on that in a futire post), then we headed over to the CSX main line at Jesup, Ga., for the evening. 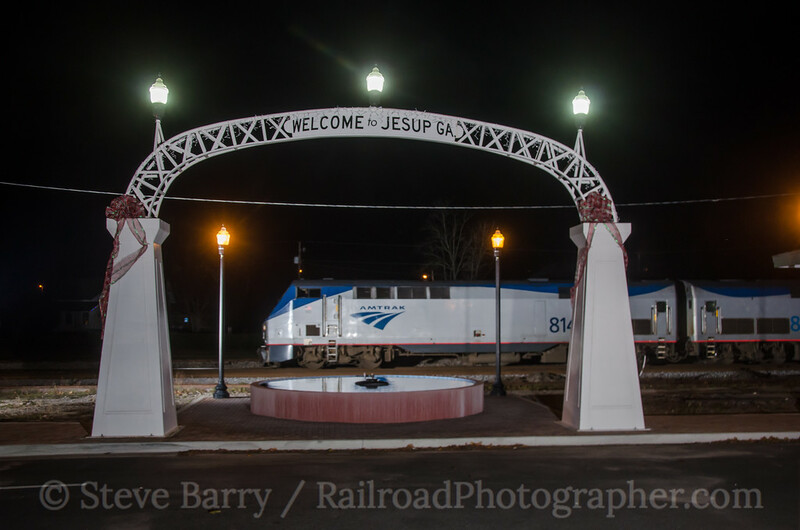 We had ATCS Monitor running on a laptop, and as darkness fell we could see on the display that there would be a northbound and southbound train converging on Jesup shortly after sunset. The southbound was closer, so we set up for that, but it was held north of town for the northbound. This required us to figure out a good northbound shot given our lights were more oriented for a southbound. Soon the northbound appeared as the last glow in the sky was vanishing. We set up near the railfanning platform just south of the station and shot the train going away (top photo in this post). The passing stack cars allowed us to test the lights for the southbound train, and produced some interesting images themselves. Once the northbound was out of the way, the southbound appeared and we got the shot we had originally set out to get (below). 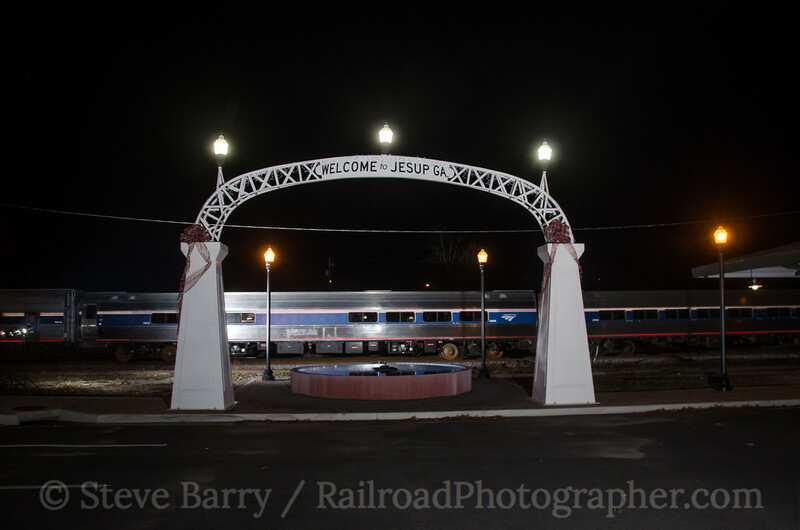 We knew a northbound Amtrak train was in the picture, running about an hour late, so we relocated to the "Welcome to Jesup" arch just north of the station. Shortly after the freights cleared, Amtrak made its station stop. ATCS Monitor also indicated a freight was running north as well; once Amtrak had finished loading and was out of the way, we stuck around for the same composition with the arch. The northbound could be heard blowing its horn for the crossing just south of the station. 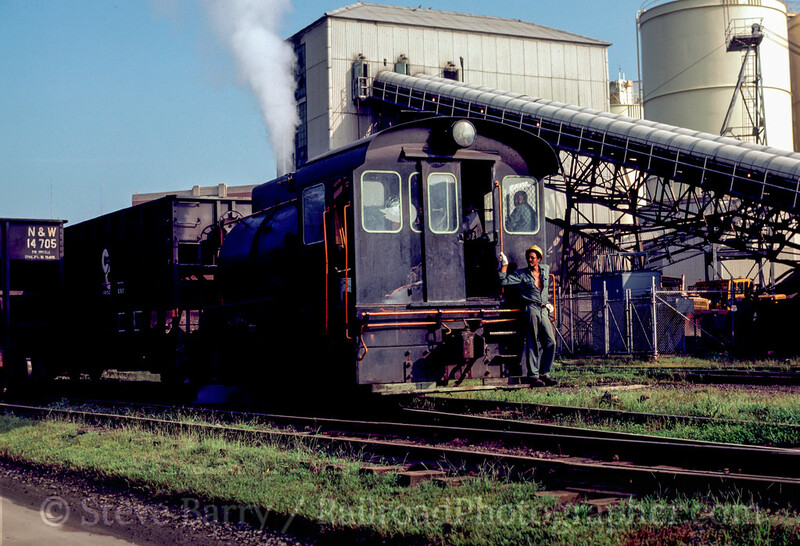 We manned our cameras, and as the locomotive came into the scene we clicked the shutter (below). We were a bit surprised to get an Amtrak train in the photo -- our "freight" turned out to be the northbound Amtrak Auto Train! With nothing else showing on the computer display, we tore down our equipment and headed into Florida. Cool Chromes is a semi-regular feature where we dig out some old slides and run them through the scanner. A few weeks ago in Cool Chromes we looked at "cab" units -- the streamlined four-axle F-units and six-axle E-units from the Electro-Motive Division of General Motors (other locomotive manufacturers had their own versions of cab units). 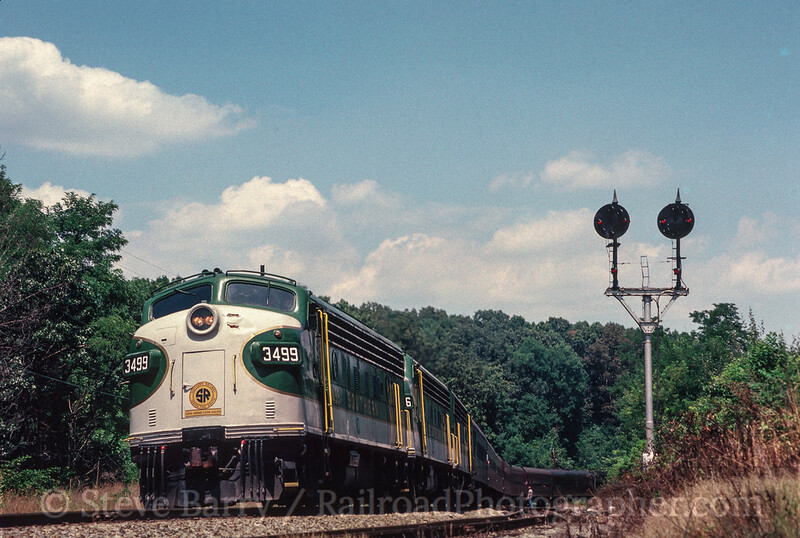 Today we'll look at a few more, starting with a trio of Southern Railway FP7s at Vaughn, Va., on July 29, 1987. FP7s took the four-axle concept, usually used on freight locomotives, and added features to make them more usable on passenger trains (primarily a steam generator for steam heat for the coaches) -- thus the "P" in FP7. The photo above shows the three Southern units (at this time employed by Southern successor Norfolk Southern) hauling a trip to the National Railway Historical Society convention in Roanoke. 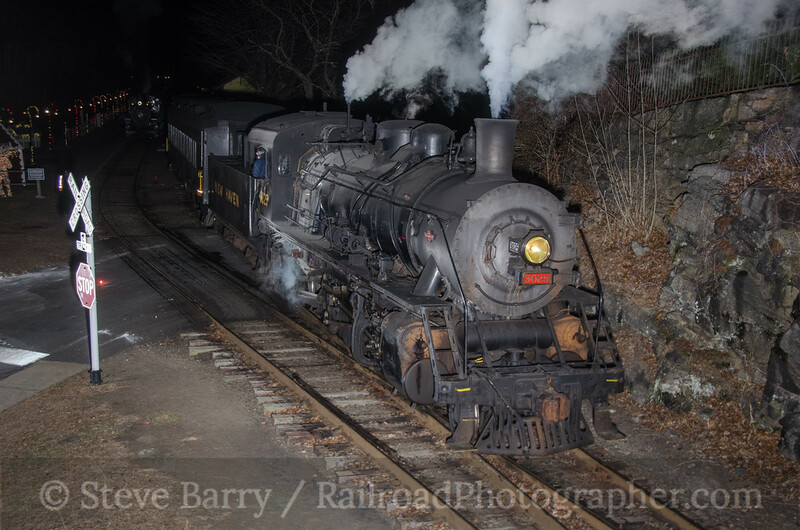 This trip departed Alexandria and headed across northern Virginia on the former Southern "B" Line between Manassas and Front Royal, where it diverged onto the Norfolk & Western's Shenandoah Line down to Lynchburg. The position light signals give this away as being on the N&W. Up next we have the oddball cab unit -- the five-axle FL9. Designed with two axles in the front and three in the back, it was originally intended for long-distance passenger service in the west where a large tank for water for steam heat would be needed. It was never used in that service, however, and instead found a home on the New York, New Haven & Hartford Railroad in short-distance passenger service. The New Haven made them dual mode locomotives, capable of operating as conventional diesels most of the time, but equally capable of operating as electric locomotives off of third rail for use into New York City's Grand Central Terminal. where diesel fumes were not wanted in the terminal or the long Park Avenue tunnel leading to it. 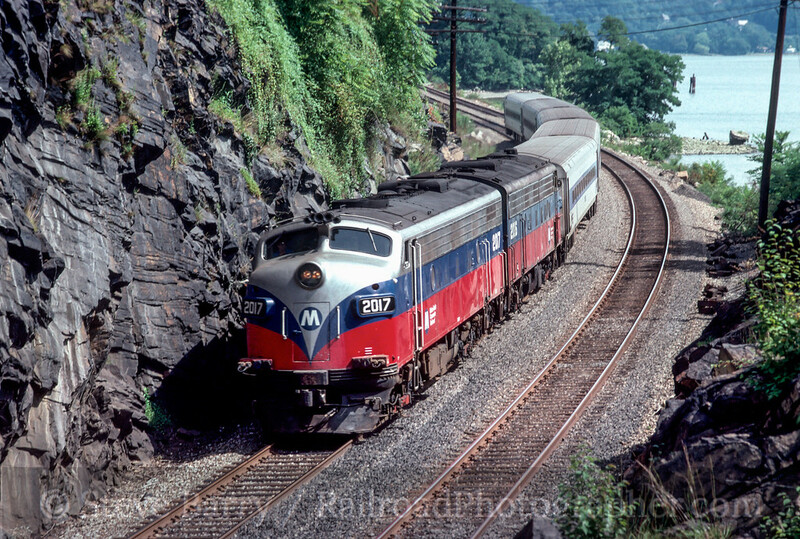 The duo above is seen in service of New Haven successor Metro North on the former New York Central above Peekskill, N.Y., at a location known as Roa Hook. That's the Hudson River off to the right. Next we'll head north of the border to the Canadian Pacific. Here we have FP7s again, but this time we have an FP7A and an FP7B -- the "A" has a cab for the locomotive crew, while the "B" is a cabless booster unit (normally, the "A" is implied when referring to cab units and is often dropped from the model designations). 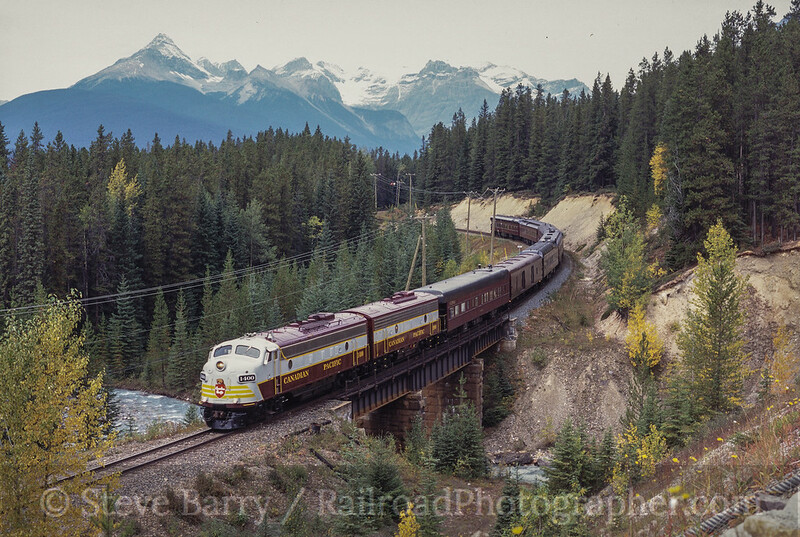 This train is the Royal Canadian Pacific, a luxury train that carried about two dozen passengers who were pampered by about two dozen crew members as the train did a multi-day tour of the Rockies and Selkirks of western Canada. The RCP no longer runs, but the trainset is still used by CPR for business purposes. The train is seen here at a classic CPR location known as Old Ottertail near Field, British Columbia, in September 2000. We finish off our look at cab units with a set that has appeared on this page before. We see "Erie 834" at Hoboken Terminal after pulling an excursion for the United Railroad Historical Society of New Jersey in June 1991. No. 834 is an E8, but it never worked for the Erie in real life (it actually worked for the New York Central); it was painted by the URHS in the Erie scheme as a tribute to a railroad that once served the Garden State. 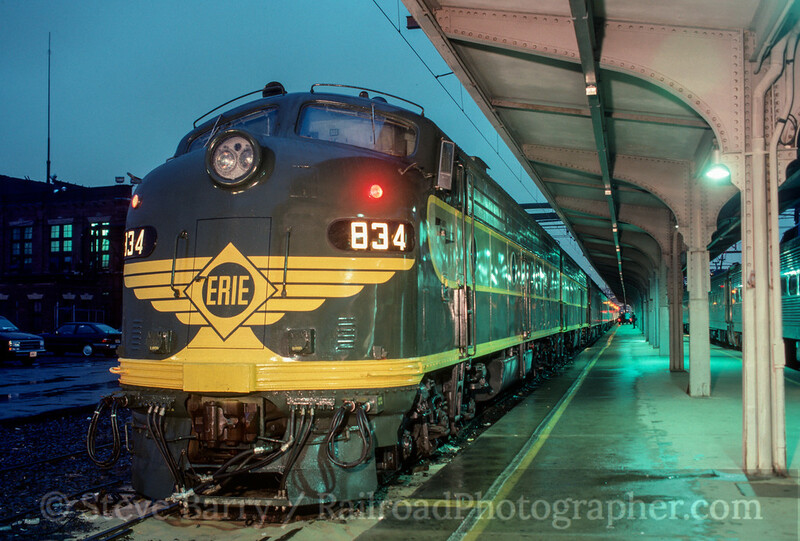 As such, it and sister 835 (actually a former Pennsylvania Railroad unit) were given the next highest numbers after the E8s that the Erie actually operated (833 was the highest). 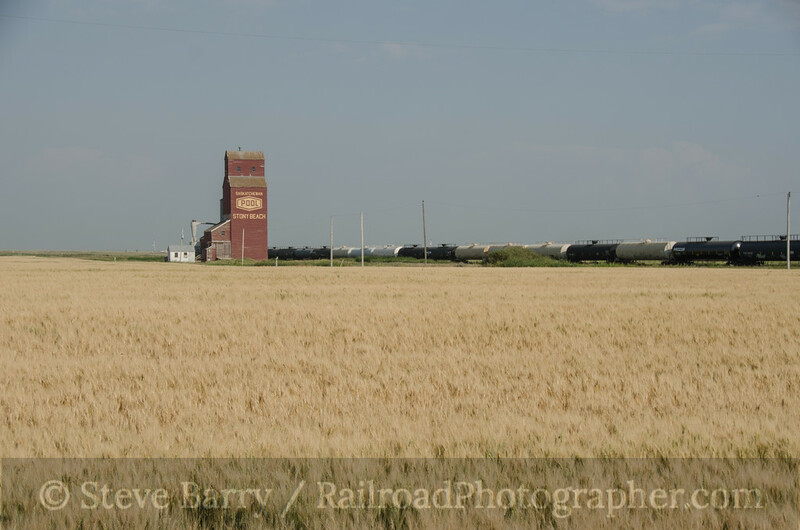 There is no doubt that part of the allure of the Canadian prairies are the wooden grain elevators that appear on the horizon as you approach many towns. The number of the classic elevators has plummeted over the past two decades, with hundreds being torn down into the early 2000s. Over the past decade the carnage has slowed, as the surviving elevators have been purchased by towns or farmer co-ops for storage or to preserve the scales located inside. 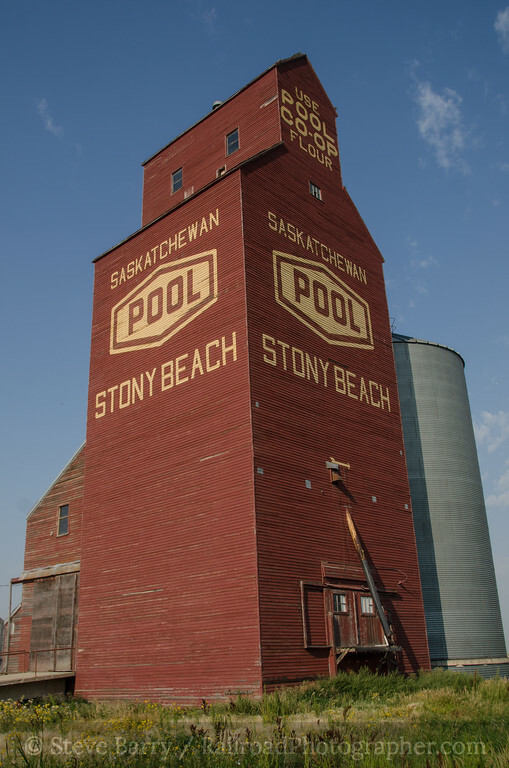 The Saskatchewan Wheat Pool controlled hundreds of elevators in its namesake province, but about ten years ago began disposing of the few wooden elevators it still had, consolidating its operations at much larger high through-put (HTP) elevators. 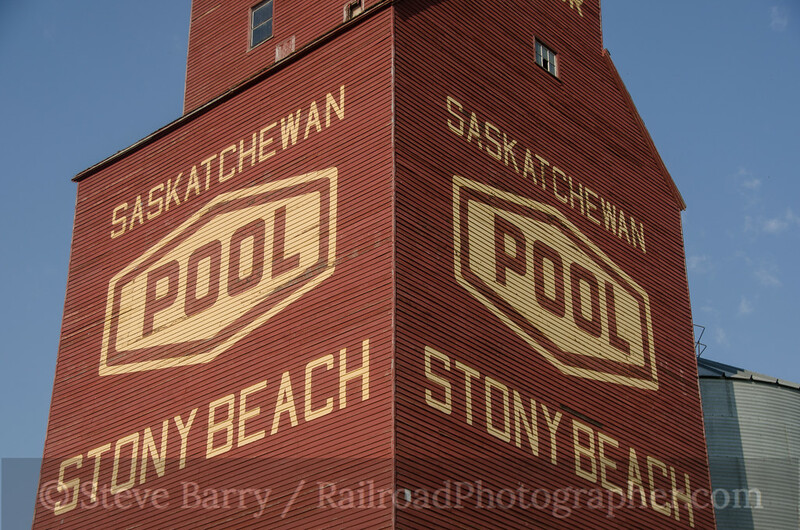 As the elevators were sold, the Pool painted over its logo, leaving just the words "Saskatchewan" and the town name (and in some rare cases, the Pool elevator number) on the building. 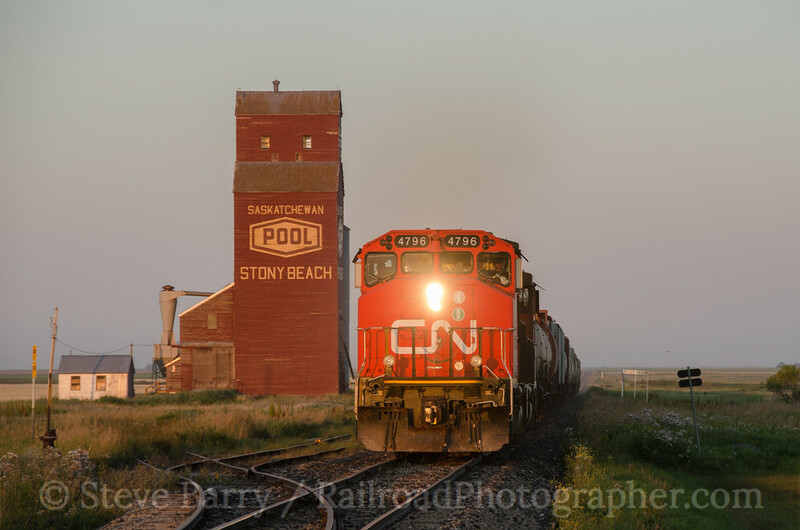 That brings us to Stony Beach, a small town (and calling it a "town" is being generous) on a Canadian National branch line located about halfway between Regina and Moose Jaw. The CN transcontinental route runs much farther to the north on its way to Saskatoon; the Canadian Pacific main line, however, is parallel to this branch just a few miles south. The elevator at Stony Beach is unusual for two reasons; first, it retains its Pool logo and, second, it's painted barn red and lacks the silver sheathing that most Pool elevators had. On August 26, I arrived at Stony Beach at about 3:45 in the afternoon along with George Pitarys and my brother Bruce. We knew a local train worked the branch out of Regina in the afternoon, but beyond that we didn't know much more. With no one around, we set about photographing the elevator from a bunch of different angles; of all the elevators we had seen on the trip, this was about the best. The dirt grade crossing, despite our best efforts to tell, was inconclusive in determining if the train had come through or not. Just as we settled in to wait, a road grader pulled up and stopped. George quickly ran over to ask the operator if he had seen a train during the day. The reply did not make us happy; we had missed the train by about 15 minutes. Still, this was a stellar location and we still had a couple of days in the area; we would be back. That chance came the next day. 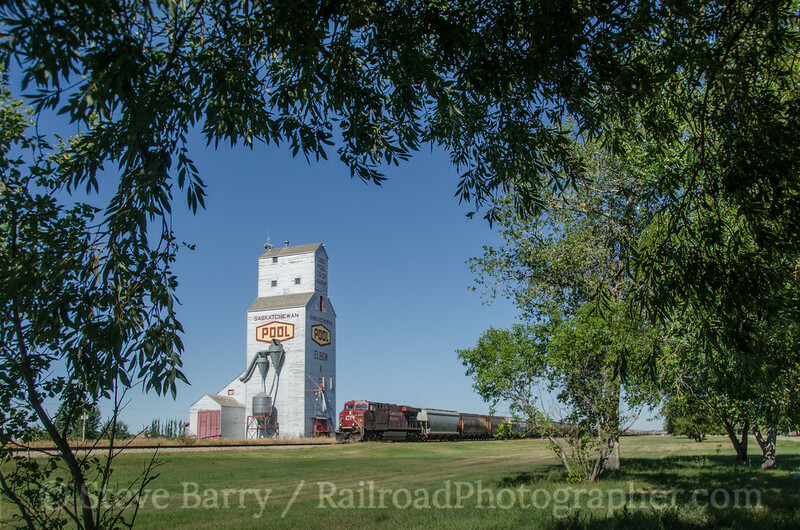 We had chased a Canadian Pacific train from Loreburn almost into Moose Jaw, with one of the highlights being another great Pool elevator, this one at Elbow. Unlike Stony Beach, Elbow was in the more traditional Pool silver; like Stony Beach, it retained its Pool logo. In fact this one was preserved as a museum. Our chase ended at about 2:30 we were not far from Stony Beach and right in the window the train was due. Arriving at the elevator at about 3:30 we checked the dirt grade crossing; the flangeways were full of dirt and debris and we were 90 per cent sure the train had not run yet. With clear skies and great light on the elevator, we vowed to stay until the train came or the light gave out. However, 3:30 became 4:30, then the clock moved to 5:30 and still no train. We amused ourselves by watching and photographing the numerous dragon flies that seemed to like our car's antenna. The sun was getting lower and lower, but there were no clouds; we'd have good light right down to the horizon. 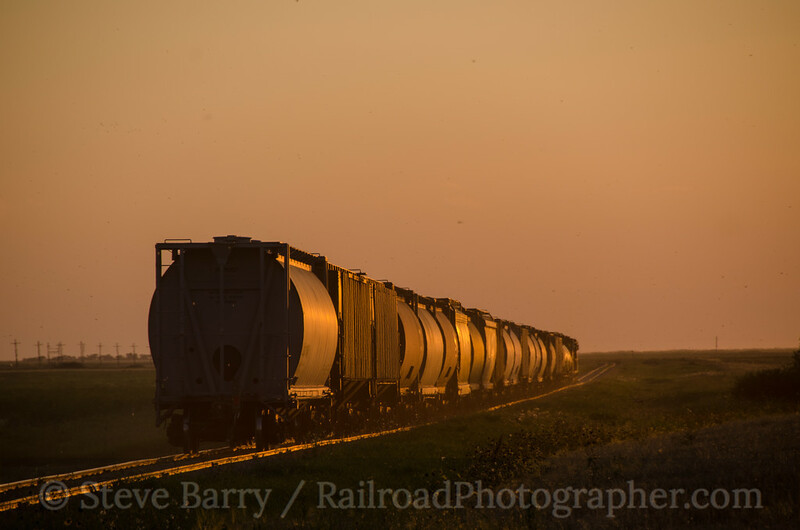 Finally at 6:30 the railroad radio had good news for us, as we heard our train leaving Regina 22 miles to the east. With a track speed of 25 m.p.h., it would take just about an hour for the train to get to us. And the sun was getting lower and lower. With the flat terrain and straight track we saw the headlight in about 30 minutes; still, the train was close to ten miles away still -- another half hour -- and the sun was getting lower and lower. 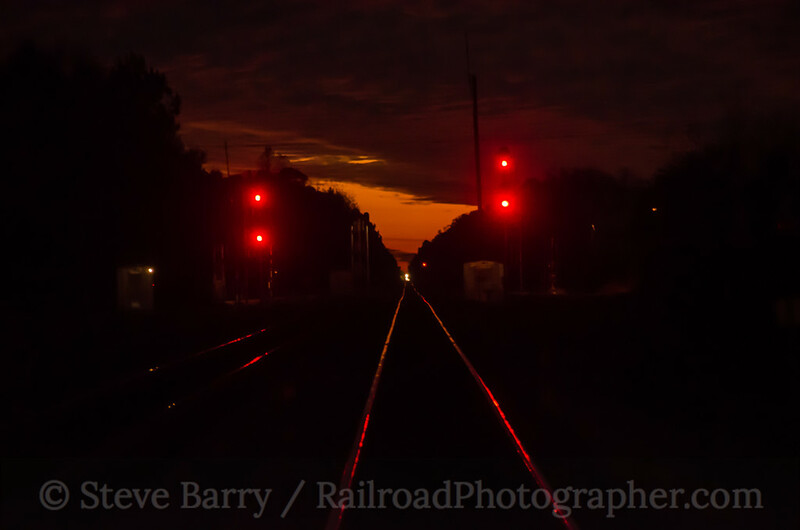 But the headlight got closer, the sun stayed above the horizon, and at 7:30 the three of us stood at the grade crossing and pushed the shutters of our cameras -- pretty much simultaneously -- and got the shot we had waited four hours to get! Success! This was really closer than we wanted it to be; the sun hit the horizon less than five minutes after the train's passage, and another two minutes after that the light had dimmed considerably. But what a way to finish the day! Our tradition for the trip was to pick "the shot of the day" at the conclusion of each day and "the shot of the trip" when everything wrapped up. We were hard-pressed to pick one for this day, however, as both the shots at Elbow and at Stony Beach were outstanding; in fact, they were hands down the two best shots of the trip. But there is no doubt the time spent at Stony Beach will make it the story we will continue to tell when the topic of this trip comes up. And the best part of any trip is the stories that we tell later. Photos from the first day at Stony Beach and the rest of that day can be found here. Photos from the second day, including the chase on the CPR, can be found here. Random Ramblings is a semi-regular feature mulling over an esoteric photo or two. The holiday rush of 1992 was winding down, and I was beginning to get the urge to do some photography. The second day after Christmas, December 27, was bright and sunny and I headed over to Winslow Junction, N.J., to see what equipment the Southern Railway of New Jersey had sitting around. At Winslow Junction there are three lines. The former Central Railroad of New Jersey is at ground level, making its way from Red Bank to Bridgeton. Two other lines, both former Pennsylvania-Reading Seashore Lines, run perpendicular to the CNJ and parallel to each other on elevated routes a few hundred feet apart; both cross the CNJ on bridges. 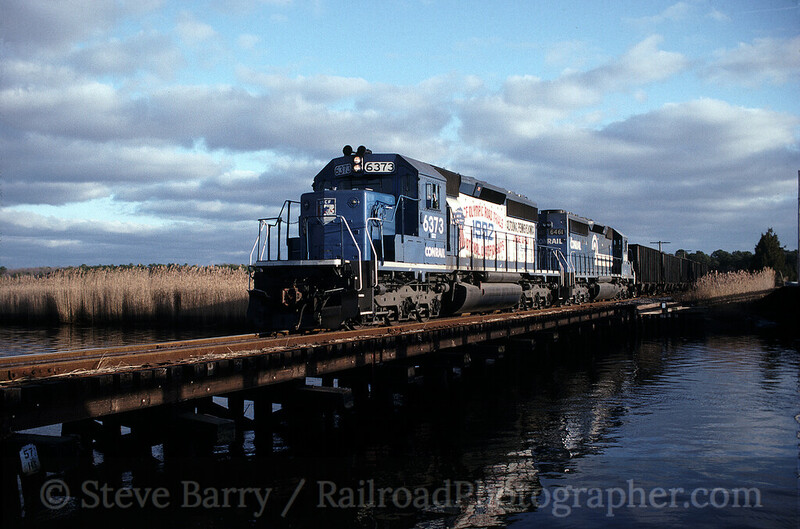 The southernmost bridge was being used by Conrail to access the coal-fired power plant in Beesley's Point near Ocean City. The northern bridge was (and still is) New Jersey Transit's line between Philadelphia and Atlantic City. 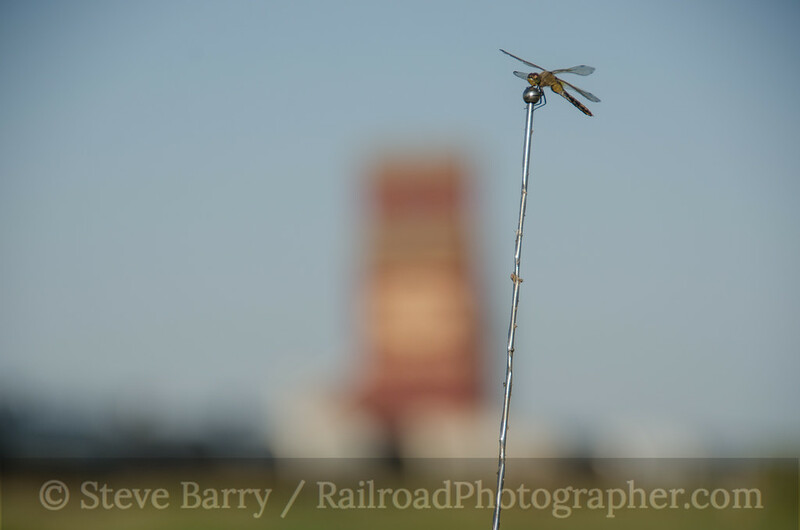 While photographing the dead power on the SRNJ, I heard a Conrail train blow for a nearby grade crossing. I quickly set up for an over-under shot of the train with SRNJ stuff beneath. 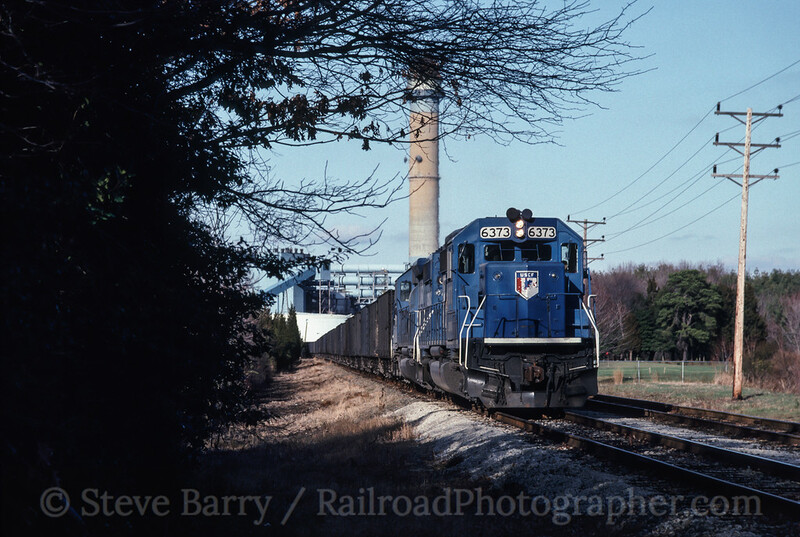 I was surprised to see the trailing unit on the southbound coal train, however -- Conrail SD40-2 No. 6373, which had been painted in a commemorative scheme for the U.S. Cycling Federation Olympic Trials and National Championships held in Altoona, Penn., earlier that year (Altoona was home to Conrail's primary locomotive repair shop). Knowing that the USCF unit would be leading the train back (and would look really good on the timber trestle near Petersburg, N.J., I decided to give chase. At the long storage track near Dorothy the crew dropped all the hopper cars and continued south with just the light engines. I kept the chase going, though, since I wanted to keep track of them for the return trip. At the last grade crossing before the power plant at Beesley's Point, however, the locomotives came to a stop and the conductor came over to me. "Give me a ride to Wawa," he said, "and we'll let you run the engines." Well, that was too good to turn down, so I took him to the nearby convenience store so he could get some coffee and food. Back at the train, the crew told me about a dirt pullover along the tracks where I could leave my car. I met them there, and they promptly put me into the engineer's seat of the lead locomotive, SD40-2 No. 6461. I ran the two units into the power plant where the conductor jumped off to get some paperwork. While he was doing that, the engineer and I switched ends and switched locomotives -- I was now running the Conrail USCF unit! I ran it back to my car and got off, then the engineer changed ends again and ran back into the plant to get his conductor and the outbound train. After about an hour the train emerged from the plant (lead photo above) and the return chase was on. I went directly to Petersburg and set up for the shot I wanted and nailed it (below). With teh sun rapidly setting into the December sky, I packed it in and headed home. Not only did I get to photograph the elusive USCF Conrail unit, though -- I got to run it. Cool Chromes is a semi-regular feature where we look at slides that have recently passed through the scanner. Today's edition of Cool Chromes celebrates the lowly switcher, the workhorse of the railroad. We'll start things off with an NW2 built by the Electro-Motive Division of General Motors in June 1948 (above). This engine originally ran for the New York, Ontario & Western, which was abandoned in the late 1950s. The locomotive subsequently became the property of the New York, Susquehanna & Western, which painted in back into the NYO&W colors. 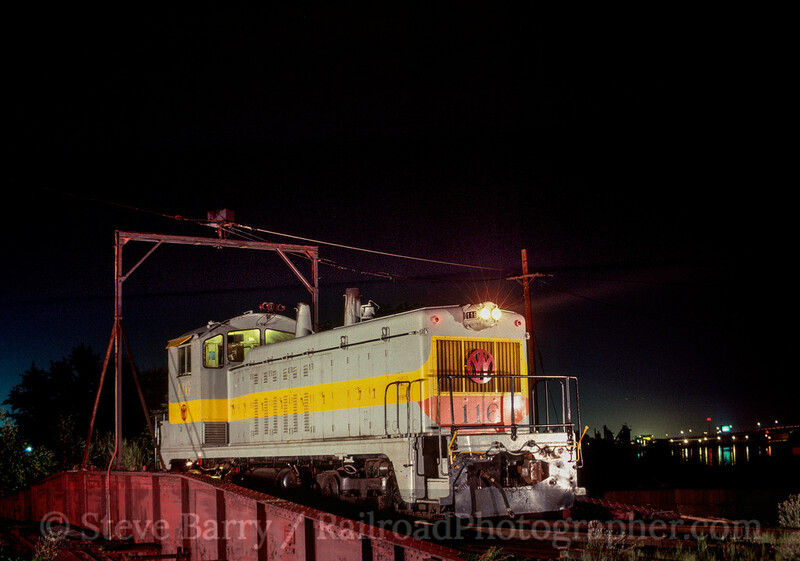 It is seen here at the Susie-Q's now-gone engine facility at Little Ferry, N.J., in August 1988 during a night photo session for the convention of the National Railway Historical Society. 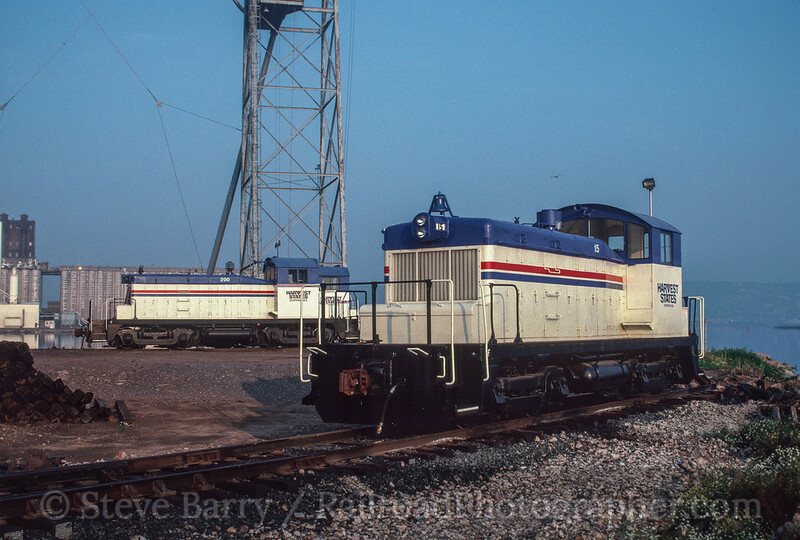 Next up is a pair of SW1200s, also products of EMD, working for the Elgin, Joliet & Eastern. No. 322 was built in June 1964 for Kansas City Terminal while No. 300 was built in June 1960 for the EJ&E. 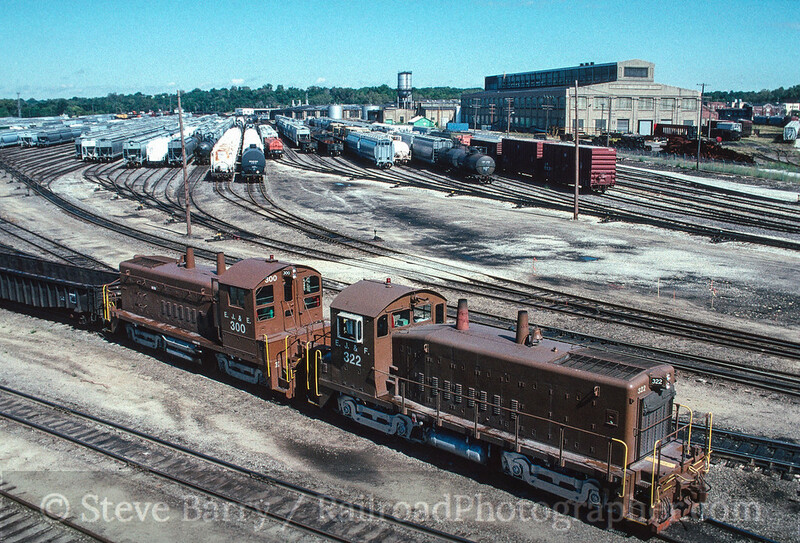 We see them switching in front of the EJ&E shops in Joliet, Ill., in October 1990. Our third chrome features at least two SW1s (also from EMD) working the Harvest States mill along Lake Michigan in Superior, Wisc. No. 15 was built in December 1941 and began its life working down south for the Louisville & Nashville. In the background is No. 200, built im March 1953 for the Portland Railroad & Terminal Division in Oregon. We'll finish off with an unusual locomotive. Potomac Electric Company used a steam locomotive to switch its Alexandria, Va., facility until late 1979. No. 43 was built by Heilser in 1938 and is a "fireless cooker" -- it burns no fuel of its own, but instead would plug into the power plant's steam line for a charge of steam that would keep it running for a couple of hours. We see it here in September 1979 during a tour for the NRHS Convention. No. 43 would be retired shortly thereafter and now resides in the B&O Railroad Museum in Baltimore.